These muffins look pretty tasty, right? Below is my first blog recount of a recipe mishap. If you have read the handful of posts that I've written so far, you will start to get the idea I'm a big Costco fan. Even though I'm not feeding an army at my house we buy in bulk and generally it works out ok. My most recent purchase was a huge 4lb container of strawberries. 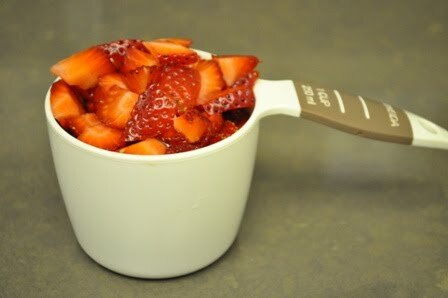 Given hubby won't touch strawberries (unless they are in jam form) it was all on me to use them up. I even considered making strawberry preserves. But I've never done the whole canning thing and wasn't ready to go there. 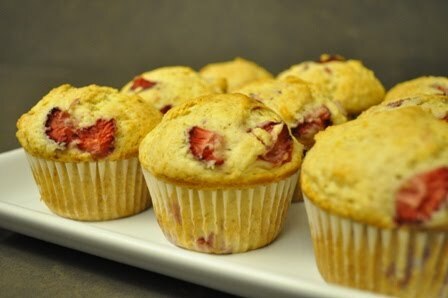 After eating the strawberries a la carte and slicing them up in my cereal for a couple of days I zeroed in on a recipe in my new Sweet Melissa Baking Book for Strawberry Muffins with Fresh Lemon and Rosemary. I didn't have fresh rosemary but I had all the other ingredients. And the next day I was going into the office where people would eagerly gobble up any kind of homemade treat. 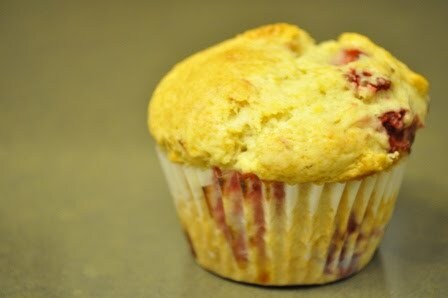 So at 9pm on Tuesday evening I started gathering the ingredients to make these tasty sounding muffins. 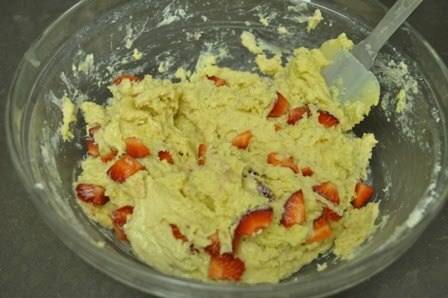 Most of my experience with baking starts with combining the wet ingredients and then adding in the dry slowly. This recipe was just the opposite. Melissa Murphy instructs you to put the dry ingredients in a large bowl, making a well in the center and then adding the wet. I followed the recipe diligently. 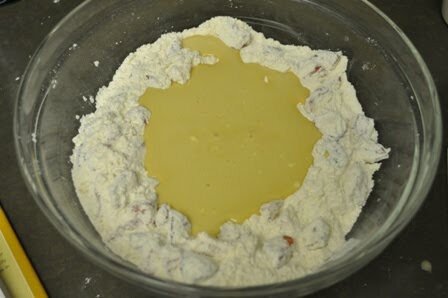 I pulled the dry ingredients from around the sides of the bowl in the well of melted butter, sugar, milk and cream. When everything was combined I was left with a dough consistency rather than a batter. The problem with this recipe failure is I am not sure what went wrong. I just checked out a previous Sweet Melissa Sundays muffin P&Q and found that several other bakers reported a dense muffin. So maybe these weren't as far off base as I thought? I guess my muffin expectations were and are different. These were definitely more scone/biscuit like than muffin-esque. Not my personal preference. It looks like I'll have an opportunity to give Melissa Murphy's muffins another shot the week of May 9th when Sweet Melissa Sundays tries out Orange Blueberry Muffins with Pecan Crumble. All of SM's muffin recipes start with the same base recipe. I think I will scale back on the flour and see how that goes. More to come on muffins!